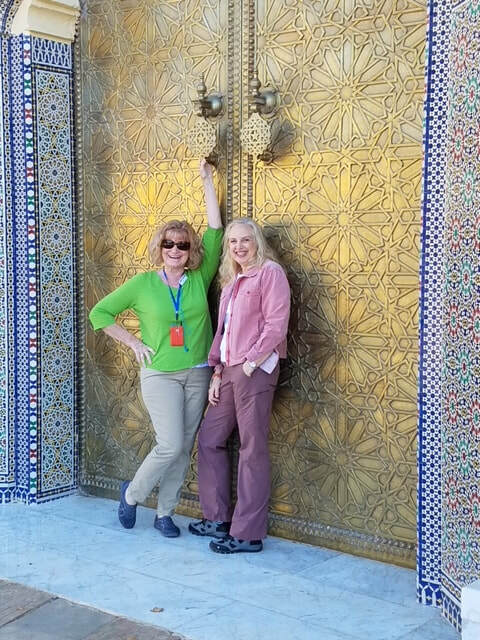 David and Blair took 16 travelers to Morocco for an adventure that was a delight to all of our senses. 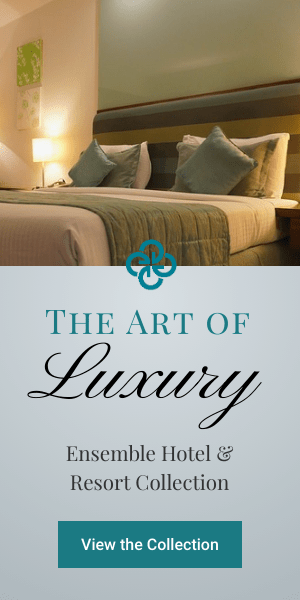 At once exotic, because of its Arab roots, and familiar, because of European influence, the experience exceeded our highest expectations with a perfect mix of familiar and new. Morocco's dazzling mosaic of Arab and Berber cultures—with a dash of African and French influence—is strange, romantic, alluring and disconcerting. The old cities, called medinas, are energetic places, where daily life - both human and animal - navigate narrow streets. The aromas of mint tea, lamb, and chicken permeate the maze-like lanes in a rhythm that has lasted for centuries. Royal palaces have arched entrances of colorful and intricately designed mosaic tile done in a technique that has not changed in hundreds of year. The doors to the palaces and mosques so large they seem to be meant for giants and reside in contrast to modern buildings. The Sahara Desert is a seemingly endless expanse of undulating sand dunes framed by a deep-blue sky, and is home to nomadic desert dwellers who ride camels while using their cell phones. 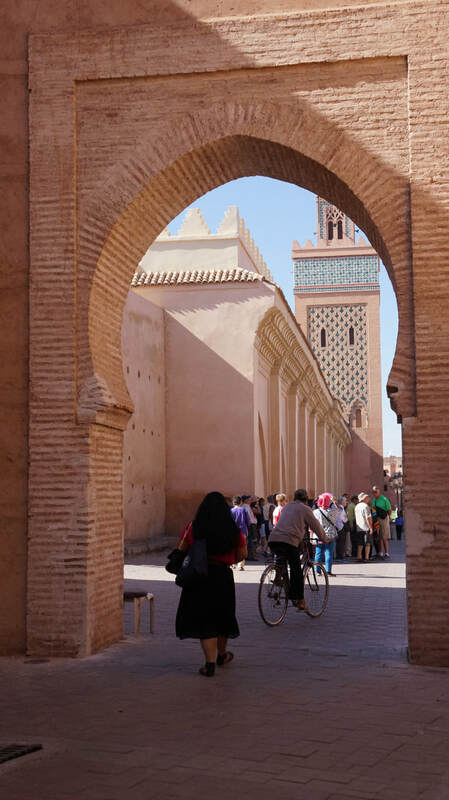 With such a wide variety of experiences, Morocco feels like a clash of modern and traditional. 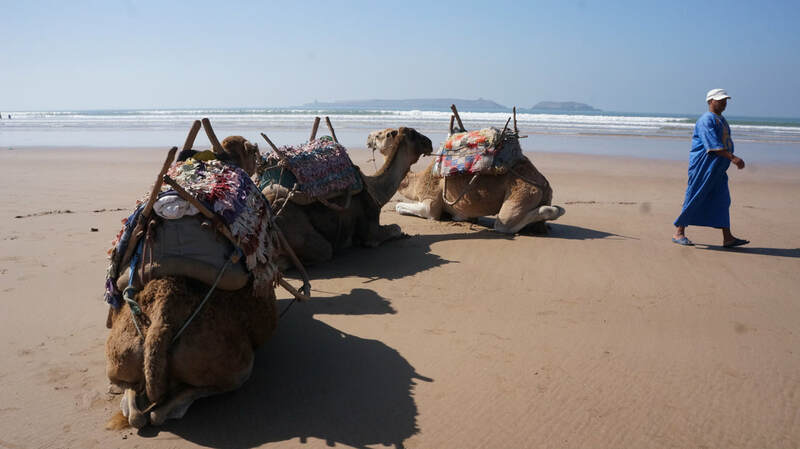 Even the most seasoned traveler will be fascinated by the stunning beauty, and variety of experiences available in Morocco. Old Medina Souk - While the Souk in Fes and Marrakech are bigger and offer more variety we thoroughly enjoyed wending our way through the ancient alleyways which lie within the Old Medina walls. We did succumb to brightly colored pottery (we found this design no where else) As with most other souks in Morocco, bargaining is a must. I consider myself a world class bargainer but the Moroccans take it to a complete other level. I dove in, enjoyed the cultural experience and have an amazing set of dishes! While I rolled my eyes at the thought of visiting a restaurant created specifically created for tourists I was delightfully surprised by the atmosphere, quality of food and the American style service. These door to Royal Palace are truly fit for a king. Cathy & Diana unsuccessfully trying to gain entry! As we departed for the capital city of Rabat, recently listed by UNESCO as a World Heritage Site, it was interesting to note that the desert scrub was gradually replaced by rolling hills. This would not be the last time we were surprised by the changing landscape. The landscape Morocco is as varied as it's people. Royal Palace residence of King Mohammed VI. Since the reign of sultan Mohammed ben Abdallah (1745–1757), the sultans and kings have maintained a palace in Rabat. The current building was built in 1864, to replace the older palace, by Mohammed IV. Morocco had previously been under the control of the French in 1912, they wanted the sultan to be largely stationed in one place, near their own administrative headquarters, showing his acceptance of the new regime. Now it is the residence of the current king, King Mohammed VI and his family. The palace sits at the end of the mechouar, a large parade ground also containing a small mosque. 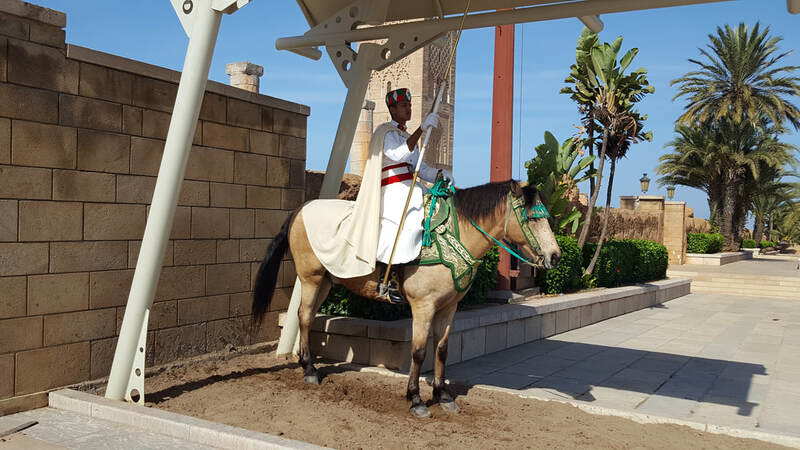 The mechouar is used for large public assemblies, such as the return from exile of Mohammed V in 1955. As well as living space for the king and the royal family, there is accommodation for the Moroccan Royal Guard. The palace complex also contains the Collège Royal, a school for senior members of the royal family, a cooking school, and a ground floor library built to contain the manuscript collection of Hassan II. There are extensive gardens and grounds surrounding the palace, the design of which was influenced by French formality, traditional Arabic motifs and local horticulture. ​​Hassan Tower & Mausoleum of King Mohammed V - The Hassan Tower is the minaret of an incomplete mosque started in 1195. The tower was intended to be the largest minaret in the world but only reached 140 ft. about half it's intended size. The rest of the mosque was also left incomplete, with only the beginnings of several walls and 348 columns being constructed. Mausoleum of King Mohammed V , adjacent to the Hassan Tower, is one of the few holy places open to non-Muslims, which is both a lavish architectural marvel and a monument to a great ruler. We were greeted by guards with antique rifles sitting on horses just outside the Mausoleum protected by canopies as a defense against the blazing sun. 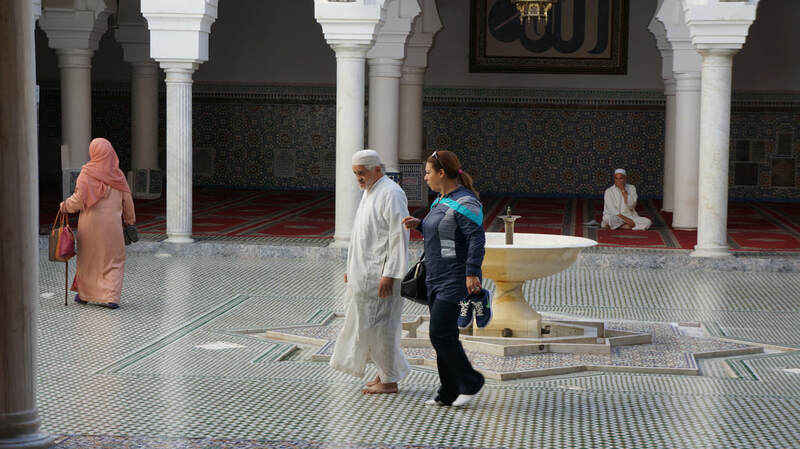 This country has a real affection for their Kings and their families; pictures of the current king, Mohammed V, are everywhere and he is frequently pictured with his wife. Mohammed VI is a modern king and decreed that men should only have one wife. Prior to his reign men could have multiple wives. Blue Town As we walked down ancient narrow streets, within the walls of the 12 the century kasbah, we encountered a residential area of Rabat. 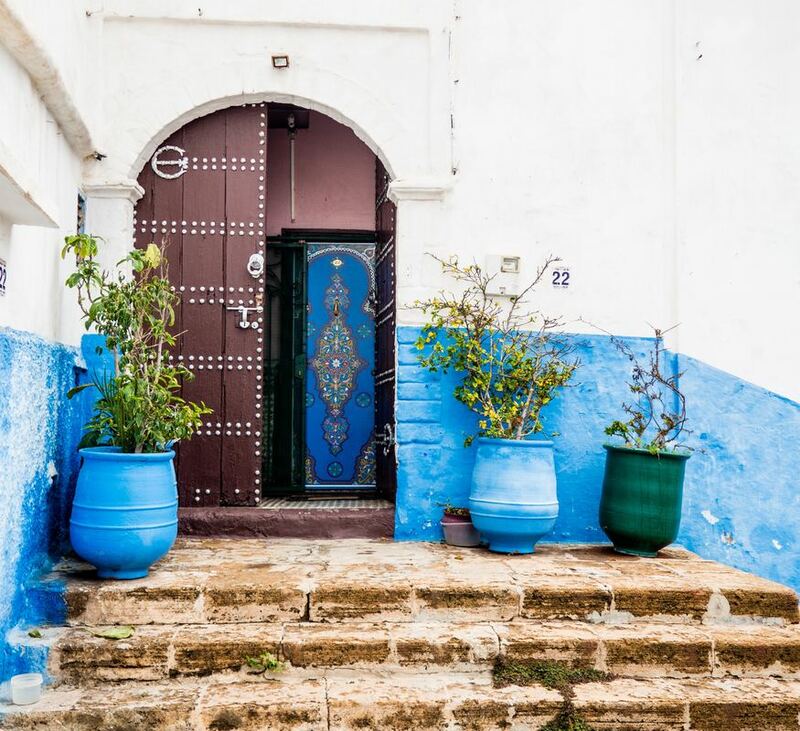 We were entranced by the blue walls, painted to deter insects, the ornate doors and the many cats sleeping on the stoops. In blue town, as it it affectionately called, the homes were two and three stories high with laundry and TV dishes peeking over the roofs. A hypnotic blend of ancient and modern. 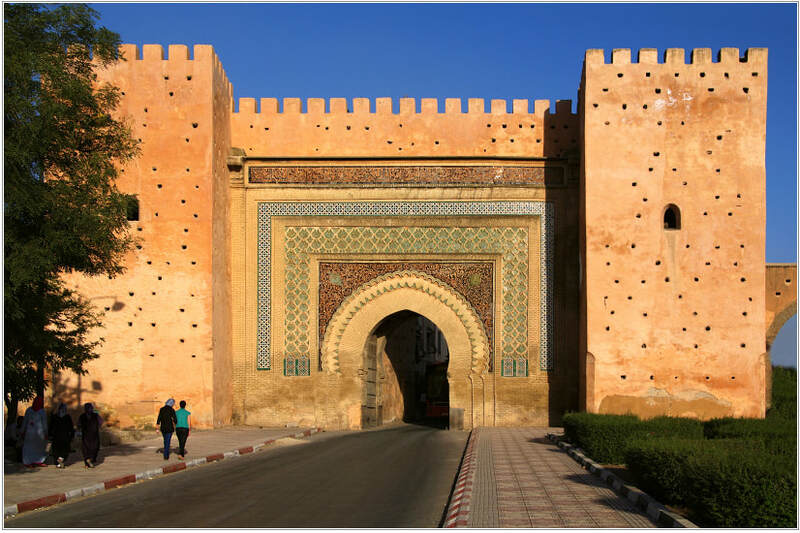 Bab el-Mansour - Meknes, one of the kingdom’s great imperial cities dating back to the 11th century, and its surroundings have remained unchanged for centuries. The Bab el-Mansour, the monumental entrance to the imperial city and focal point of Place El-Hedim. 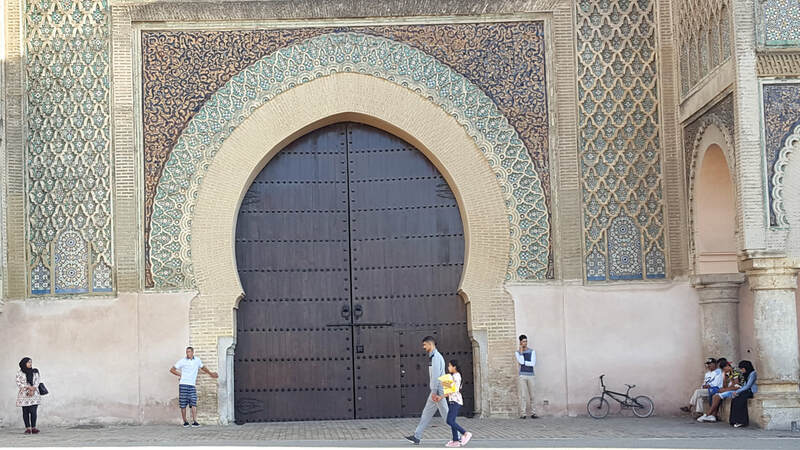 Meknes is an impressive city in Spanish-Moorish style, surrounded by high walls with great doors, where the harmonious blending of the Islamic and European styles of the 17th century are still evident today. ​Souk - Within the walls of the medina's narrow passageways and alleys are shops that have been passed down from father to son for generations. The families live over the shops where only the men work where are only for women and are used to dry clothes. The deeply held customs of the role of women and men in this society is ingrained and slow to change. The men shop, work and take coffee together while the women took care of the children and home and only appear on the street with each other and never in a cafe. This caused an interesting and lively discussion between our guide and our western group where we each tried to understand our different views. The shops in the medina were fascinating as, similar to our grocery stores, there were sections devoted to bread stalls, vegtables, candy and butcher shops. Many of us felt culture shock when we saw the butchers shops stalls adorned with the heads of goat, beef, camels and sheep prodominately displayed. 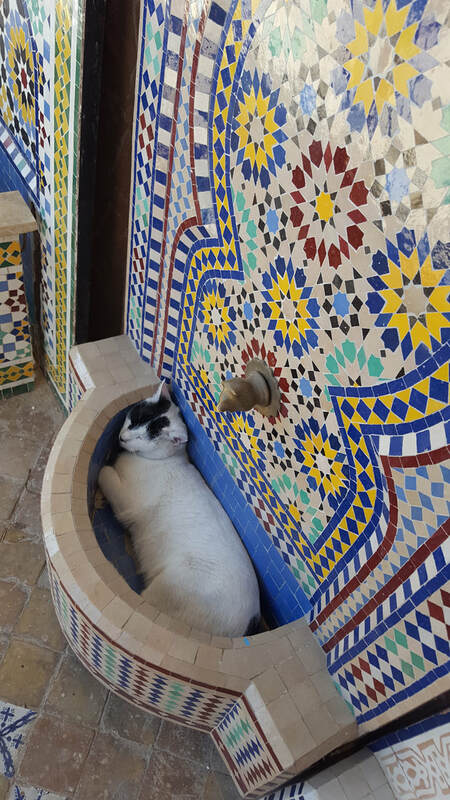 In Morocco there seem to be ever present cats belonging to no one and everyone. They are useful for keeping the rodent population down which prevents shop keepers loosing their wares to hungry rodents. Local Food - We continued to Fes and were treated to a superb Moroccan feast and traditional folklore show. Upon entering an ancient palace at the entrance to the medina, we were awed by the stunningly renovated and decorated palace adorned with the intricate tile mosaics so ubiquitous to Morocco. In this lovely setting we had a delicious, traditional Moroccan meal that included harira soup (a thick vegetable soup), chicken tagine (savory chicken cooked with vegetables and spices in clay dish) and Pastilla (a mouth watering dish of crispy phyllo dough wrapped around spiced, shredded chicken and topped with sugar, almonds and cinnamon) and wine. Even though Morocco is a predominately Muslim country alcoholic beverages are widely available for tourists. While we were enjoying our food, admiring the setting we were entertained by musicians and a belly dancer. A truly memorable evening! Medina - Luckily our guide navigated us through the medina; the walled city of hidden courtyards, mosques and workshops, the bazaar and one of the world's oldest universities. We learned about the ancient craft of carpet making, were treated to tea as is the custom, while gaining an insight into the motifs and colors used in the designs. We witnessed first hand the unique and age-old techniques of how pottery and khobz, the traditional local bread, is made. In the bazaar was a dizzying array of vendors selling food, clothes, leather goods and beautiful lights. 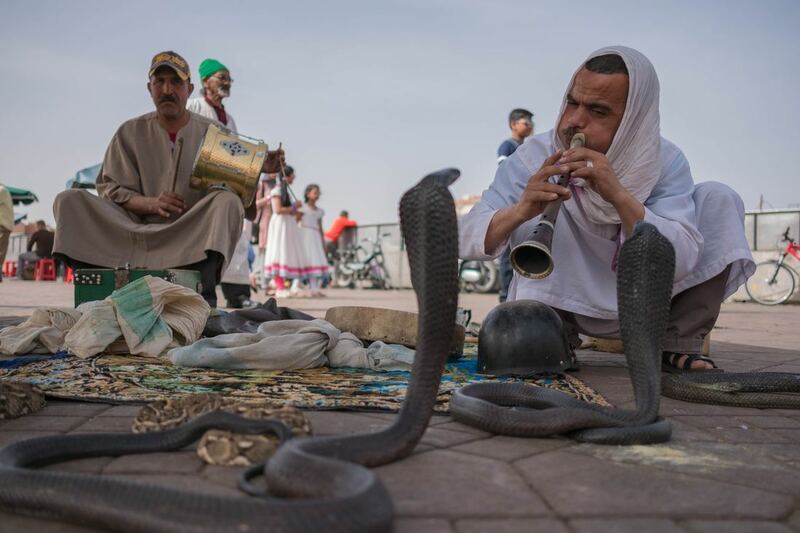 ​In with the vendors we came upon the University of Al-Karaouine, which is considered by the Guinness World Records as well as UNESCO as the oldest continuously operating, degree-granting university in the world. We were able to briefly speak to a shy young student from Kenya that was attending the university. Touring the mosaic factory was fascinating and we were privileged to see this waning craft. Zelliges, as the hand made Moroccan tiles are called, are created from natural glazes, pigments, and terracotta clay and they are fired in hand made kilns that are fueled using olive pits. Then, artisans using small, extremely sharp chisels cut tiny pieces of colorful tile into the shapes of stars, circles, squares, rectangles and rhomboids. Amazingly, even though everything was done by hand without even a template each piece was precise and the sizes were consistently the same. These interlocking pieces were then placed upside down in an intricate, puzzle-like design, within an iron form, so that only the terracotta side was exposed. The completed design was then covered with plaster to create a solid piece. Only when dry was the form was turned over exposing the design. 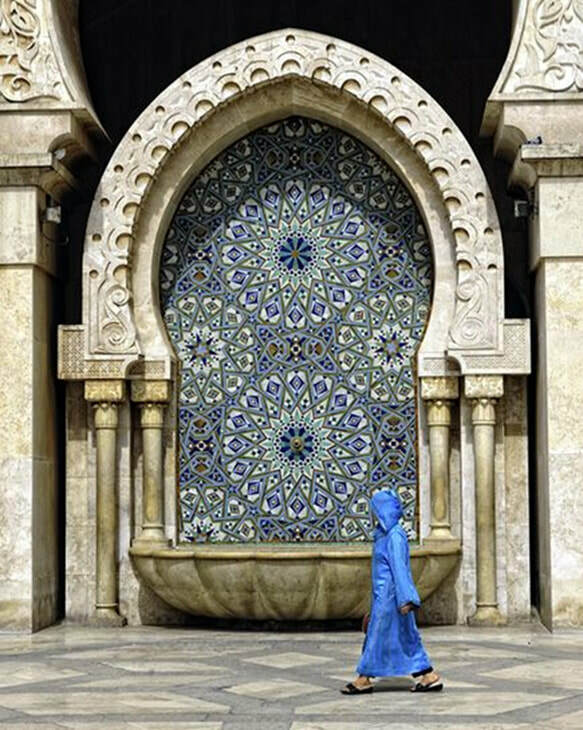 The process is handed downed from generation to generation by maâlems (master craftsmen). Because such attention to detail is needed, with additional knowledge required about the traditional designs, this highly skilled training starts in childhood. Sadly, younger people are less interested in acquiring this skill and are turning to higher paying jobs. 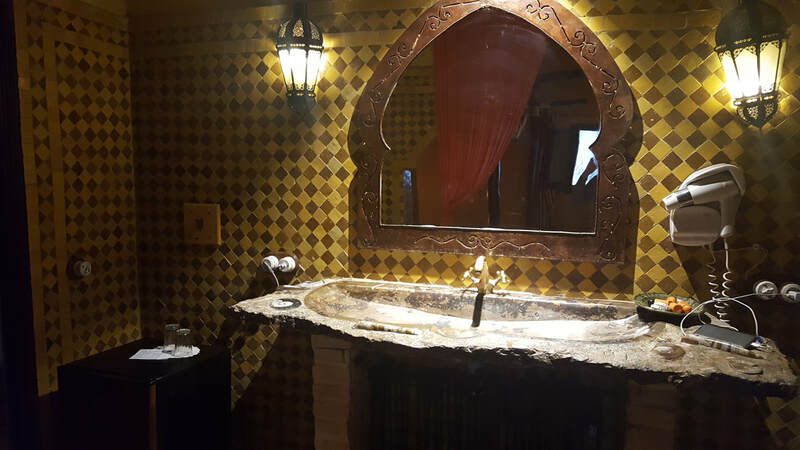 Bathroom at the Kasbah Hotel where the sink is made from fossils. ​We leave the bustle of Fes behind and head for the spectacular snow-capped High Atlas Mountains. Passing through the great cedar forests of Azrou we were disappointed at not getting a glimpse of the Barbary Apes that are frequently seen here and live no where else. Enjoying the beautiful scenery we continue through the magnificent Ziz Gorges to Erfoud, where we literally stayed at the Kasbah Hotel on the edge of the Sahara Desert. It is a fantastic place, situated among the dunes and palms where we felt like we had stepped back into a more traditional time. Honest to it's heritage the Kasbah was built with adobe, the traditional Moroccan building bricks, and decorated with regional materials. Yet we had all of the modern amenities westerners would expect. This part of the Sahara was once under the sea and as the sea receded it left behind a huge cache of fossils. Fossils are sold everywhere even in the restaurants! We could have bought a fossil sink in the gift shop at the Kasbah Hotel similar to the one we had in our room. 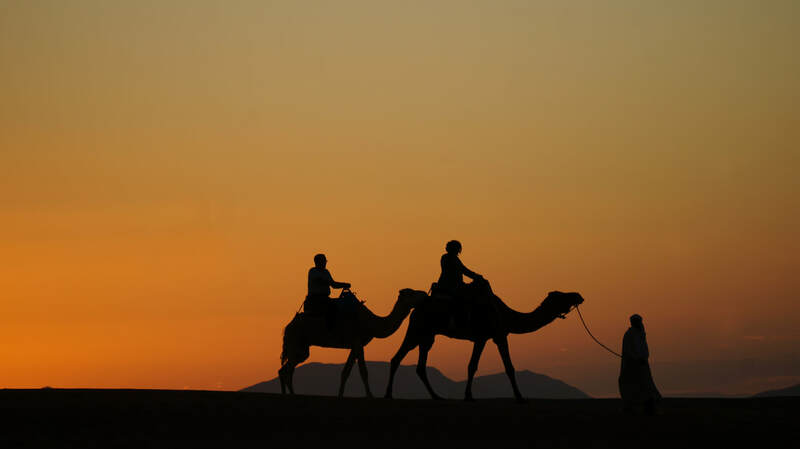 While not part of the tour we were able to take a private tour into the Sahara Desert to ride camels and watch the sunset. For some reason I did not expect the sand to be red. As the sun set in this beautiful setting the temperature dropped from hot to just a bit chilly faster than expected. This is a not-to-be-missed experience. ​We ventured towards the oasis of Tinehir and explore the Todra Gorge, known as the Grand Canyon of the Sahara. At Boumalne-du-Dades you will encounter the dry, rugged Dades Valley that is dotted with oases of figs, olives, date palms and castellated mud houses hugging the slopes. Meet the locals of the region when you visit a traditional Nomad house to try authentic Berber tea. The Road of a Thousand Kasbahs concludes at Ouarzazate. It is known as the Film Capital of Morocco, with blockbusters such as Lawrence of Arabia to Star Wars having been filmed here. Tizi n' Tichka pass. 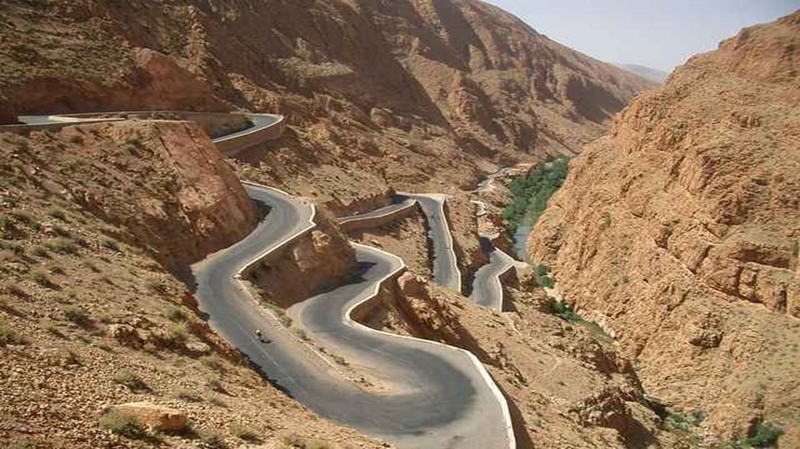 The pass through the Atlas mountains is an unbelievable array of switchbacks. Luckily, we were blessed with a bus driver, Ibrahim, who was both cautious and very familiar with the road. ​Tizi n’Tichka Pass, on the way to Marrakech, was 7300 feet altitude, we zig zagged our way down a narrow two lane switchback road with a number of areas under construction. Tichka is the Moroccan word for difficult, we saw many rebuilding projects of bridges washed out and rock slides having demolished parts of the roadway While It was a strenuous six hours for our driver, it was a fabulous experience for us! Jemaa el-Fnaa Square - Located in the old city medina and a popular gathering place for both tourists and locals our guide took us to the bustling Jemaa el-Fnaa Square in horse drawn carriages. Unesco declared the square a 'Masterpiece of World Heritage' for bringing oral history to life nightly with storytellers whose tales never end so the listeners will come back night after night. Walking through the square we experienced the carnival-like atmosphere of musicians, dancers, snake charmers, storytellers and food vendors which we found fascinating. The experiences varied from a little girl selling tissues to flying toys and food vendors enticing us to try their dishes. Famous for the pop up food stalls that appear at sunset. The food is prepped at home and then cooked to order. Morocco is noted for boiled snails and considered a delicacy so some of our group decided to try them. While I like snails I hardly see the point of eating them without lots of garlic and butter! I did try the orange juice that is fresh squeezed and the best I have ever had and considering we live in Florida that says something. As were eating there were the ever present cats looking for handouts. Watermen are an ancient profession; they are colorfully dressed, wear bandoliers of brass cups and tote a goatskin bag of fresh water. Now a tourist attraction, they are a holdover from the days water was hard to find. Our guide, Hassan, paid some water men to take pictures with us. Touristy? Yes. Fun? Absolutely and it was interesting to learn about them. However, there was one unique experience that really caught our attention. 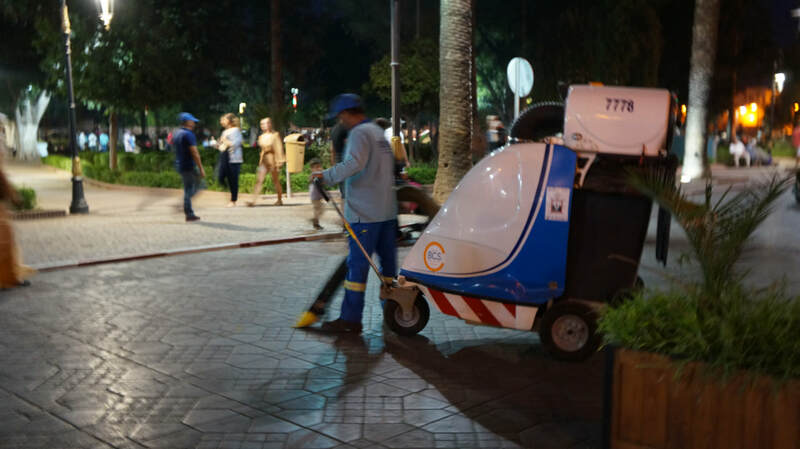 Because of the abundance of horse drawn carriages and the need to keep the square clean there were people with big vacuum machines cleaning up after the horses. Brilliant! 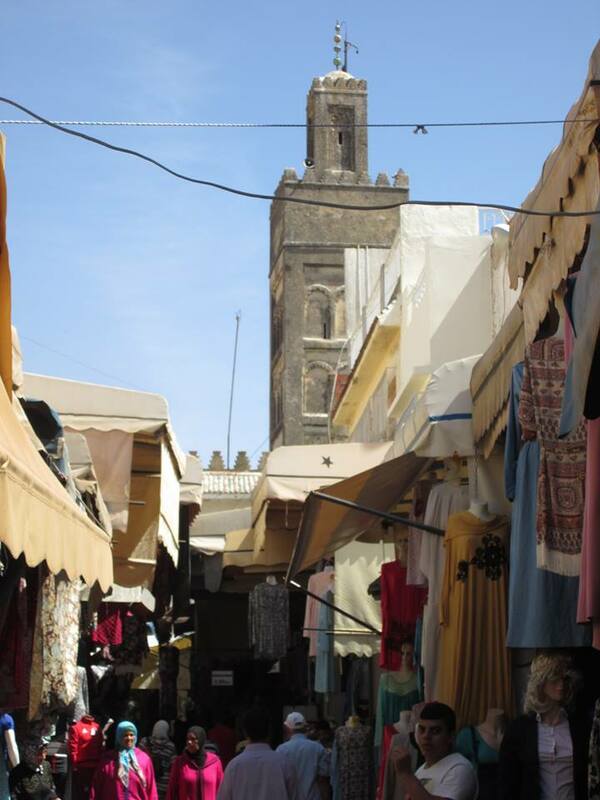 The Medina and the Koutoubia Mosque - with its minaret dominating the Marrakesh skyline. The medina is the hub of business and social interaction. It is also the best place to interact with the locals either human or feline and hone our negotiating skills. Palais Bahia - intricately decorated Palais Bahia, intended to be the greatest palace of its time when it was built in the late 19th century. We wandered from gardens to the very high ceilinged rooms surrounding more garden spaces and marveled at the intricacy of the carved stucco, the mosaic walls and floors and the intricately painted and carved wooden ceilings. Originally, the floors had been strewn with intricate rugs, the beds were wooden lofts with ladders leading to them and were bordered by silk curtains for privacy. Under the beds were wooden closets and compartments for clothing. The children slept on the main floor on cushions and rugs. The concubine rooms were smaller and were occupied by two ladies each. All maintenance and care in the harem was done by eunuchs and only the invited ever came to visit in the courtyard areas. These ladies were selected for the king by his mother. 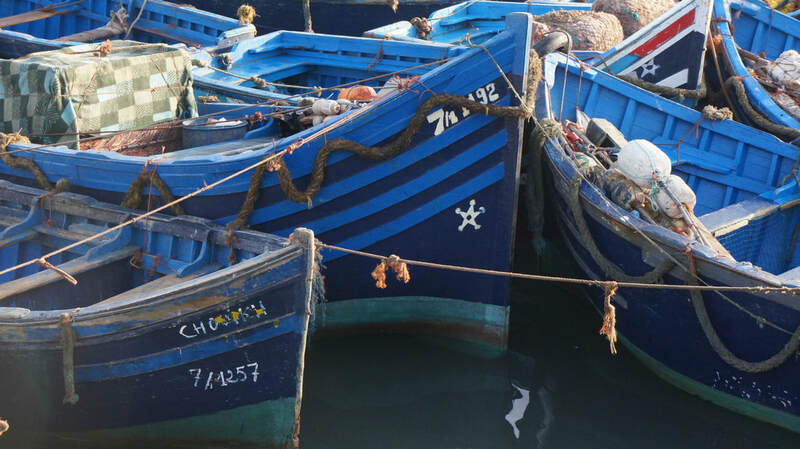 ​Essaouira - formerly known as Mogador, is a city on the Atlantic coast. The modern name means "the little rampart", a reference to the fortress walls that still enclose part of the city. As we approached we were able to observe the entire city laid out before us including an island that sheltered the fishing harbor. As we got closer and were able to see the working harbor we saw that all of the boats were painted blue creating a beautiful welcome to this port city. 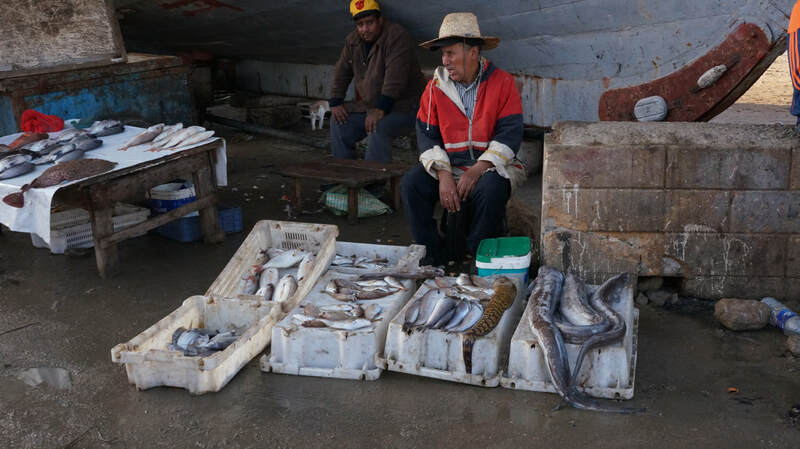 ​Fishing port - We walked to the port (travel tip: don't wear sandals) so we could see first hand the boats coming in and the days catch of moray eels, sharks, tuna, sardines, anchovies, crabs and oysters displayed on tables for sale. We watched nets being patched, boats being repaired and hordes of fat seagulls patrolling as well as platoons of happy, fat cats. We saw one small open craft, maybe twenty five feet, with an outboard motor and three fishermen whose day’s catch was in a plastic crate. It is hard to believe that this boat made enough money to fish another day. Camels on the beach - We had chosen a restaurant for dinner that was on the beach. Expecting peaceful sea views we were bewildered to see camels on the beach. Morocco is full of surprises! Farmer's Market and Goats in Trees?! 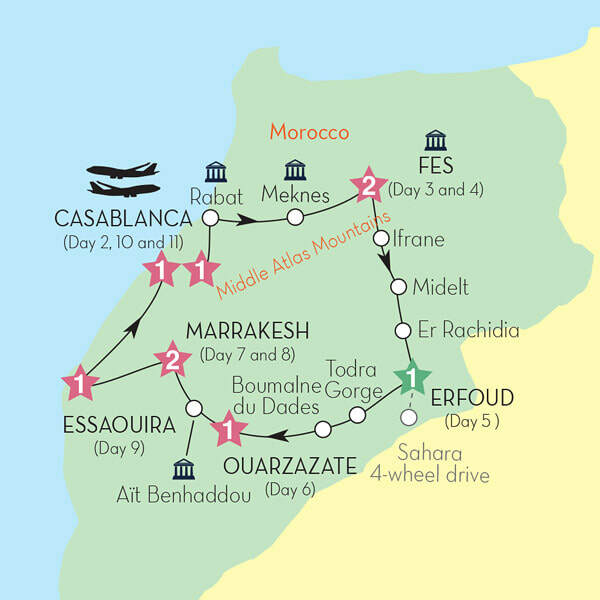 e were headed back to Casablanca to catch our flight home basking in the glow of a truly remarkable journey. Little did we realise that we had not one but two special experiences still ahead of us. 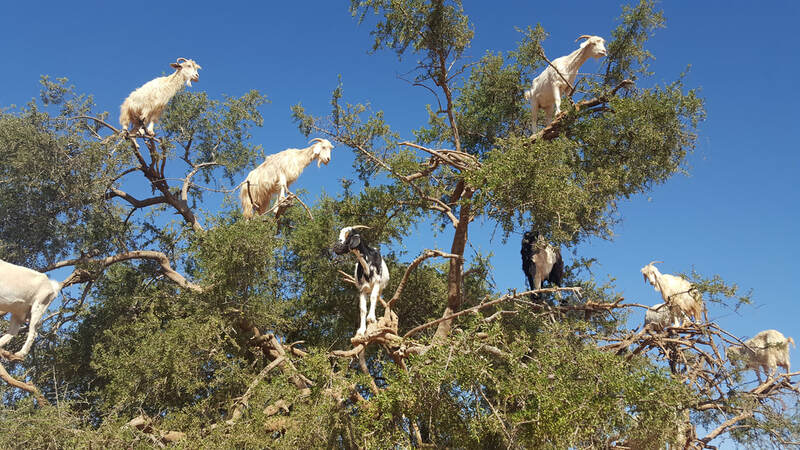 Goats in trees - Goats in Morocco climb the argan tree to get at the fruit which contains a nut after they have gleaned all the low lying fruit. After eating the fruit they excrete the hard, indigestible nut which is softened by the goats digestive juices and is collected and ground to make Argon oil products. 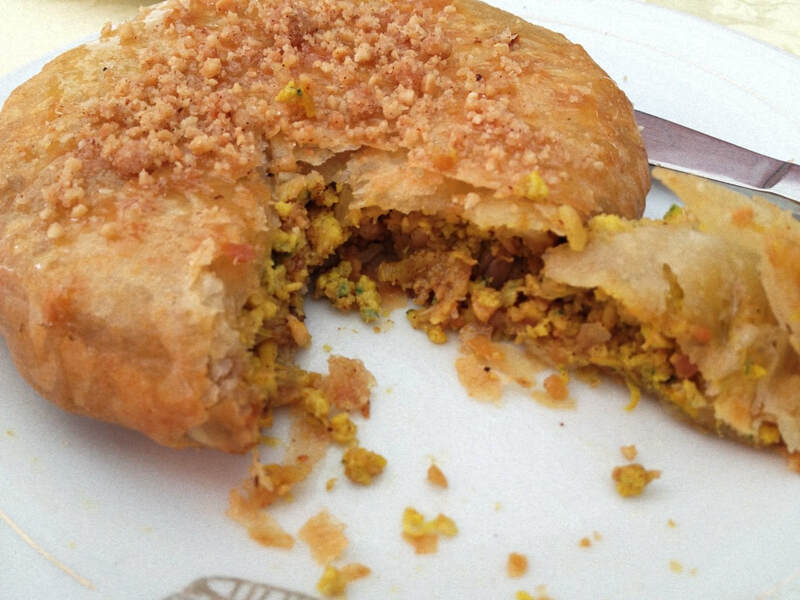 In a country where food can be scarce for wildlife, Moroccan goats have discovered a meal that they do not need to compete for and tourists love! Farmer's Market - Our next surprise was a stop at a farmer’s market open just that one day each week. This was a local market where there were no tourists other than us. We entered through a gate past the sheep market that was in the parking area. We saw a man who bought whatever was brought to him. He paid for a broken wheel rim with the price determined by weighing it on a scale. Another purchase was from a young boy brought a bag of pistachios. He must be really well connected as he literally bought whatever was offered; one of our companions lamented she had thrown away a pair used Nikes the day before. Edie was ruing having tossed her old wallet which she replaced at the last leather store. We walked past vegetables in heaps on plastic tarps under low canvas canopies. A meat section with live chickens, turkeys, sheep, camels and beef; the livestock you brought was butchered at once and sold as there was no refrigeration. The market included barbers where we watched everyday people getting haircuts. We stopped at a candy shop to sample a piece of honey candy. Instead of getting a piece we were given an entire bag. We shared it with two young boys and an old women. Candy, like smiles, seem to be a universal language. One of the most valuable things about traveling is learning about people who's cultures are very different than ours. I find it to be an opportunity to examine my western beliefs. ​Hassan, our guide, told us about his life. He was born in Tangier of his father’s first wife of three. The three wives provided him with twenty-four siblings. At age ten he borrowed a camel and dug wet sand from the beach to sell to construction crews for their concrete. He noticed the other young men were giving rides to tourists on camels and that seemed like a much more lucrative and easy profession. He gave rides until he was twelve and then was apprehended by the police and informed he had no license to charge tourists. He was put in jail for four days and emerged with the knowledge of needing to go back to school graduate and take tourism classes in college. He accomplished all this and now at fifty-two has been a tour guide for twenty-five years. We found out that most traditional marriages are brokered by the groom’s mother. Hassan’s mother was concerned his travels a a tourist guide would expose him to women from other countries; she was gratified to select his wife and he compliments her choice. Considering about 50% of western marriages end in divorce who is to say which way is better? 1/2 chicken, with skin, squeeze lemon onto it, one chopped onion placed in the tangine, one chopped tomato, six cloves of garlic, bunch of cilantro and parsley also. mix together, stuff it under chicken skin, marinate rest over the skin. Cover and start cooking for fifteen minutes. Pour a half glass of water in tangine. Place one potato cut in four slices over the meat of chicken. One tomato sliced between each potato and onion rings placed over to cover chicken, continue cooking for thirty minutes at medium. Add another half glass water. Then pickled lemon cut in shape of a hat over chicken and add a handful of green olives to tangine for another five minutes. Total 55 minutes to one hour cooking time. Pickled (preserved) lemon: ten lemons, score skin place in one quart water, one quart vinegar, tablespoon of salt, hold for thirty days.